I’ve been busy with a bunch of unrelated things lately. I’ve been animating but it’s not anything I am really allowed to show right now. I am also currently in the middle of repainting and redecorating my room. Though I am very happy about this, it is not purely for the sake of just wanting a nicer room – I haven’t really designed a room before and wanting to play with a bit of interior design. :) I have to admit, it is pretty exciting to change your room from the perspective of viewing it as an art project. The new room should also be much more well equipped for physical art making (such as stop motion… hint hint). After some research, I decided to paint two walls a warm foresty green color, and the other two (smaller) walls a darker, more olive green. Earth tones. I’m finally painting in my environment what I paint all over in my paintings. It is… incredibly soothing. It looks even better than how I had hoped it would. It’s a relief, since the colors are pretty bold (and I’ve never chosen colors for a room before), I was a little unsure. 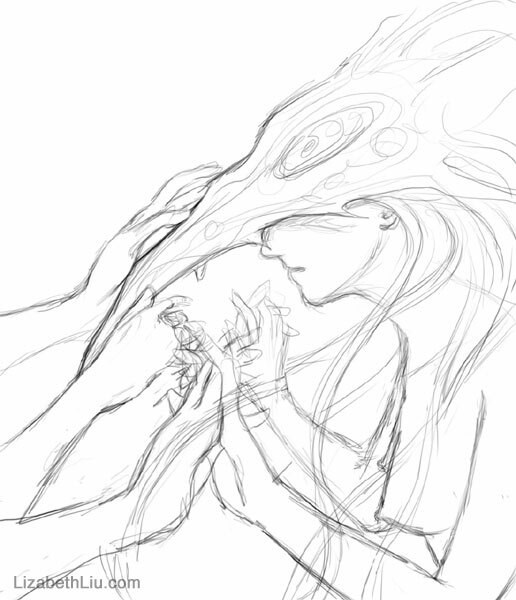 This is an image I had upon waking one morning last week, so I sketched it out. The hands are supposed to be tied by ropes (I did not paint them in). My favorite part is the hair. I’ve also been doing some pencil sketches in my sketchbook that I’ll post when I get to scanning them. Need to tweak the perspective in this one. Sketch of a boy figure. He kind of looks like he’s playing volleyball or doing some kind of sport, which made me want to do gesture studies of people playing sports, or otherwise exerting their bodies. That’s something I have little experience doing live, but it sounds like it’d be fascinatingly fun – for both anatomy and for capturing something in motion. 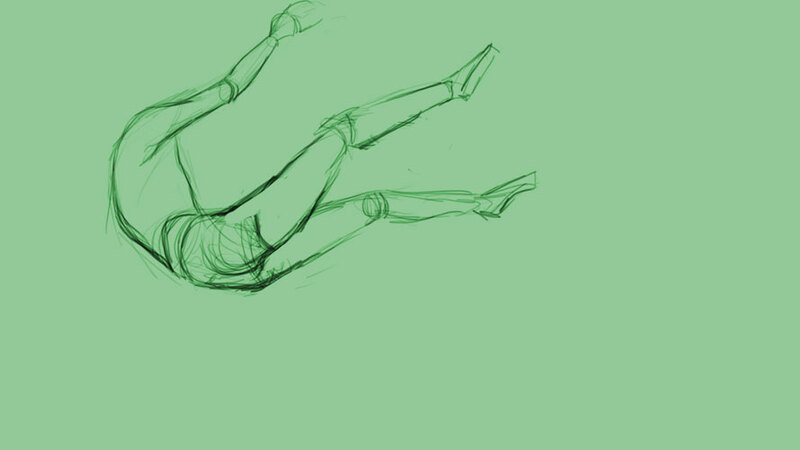 I also did some animating tonight, not very much, they’re more like animated sketches. One is of a wirey bird stick or skeleton figure and the other is of a caterpillar/wave-like walk cycle. I have to figure out an easy way to post these small studies. Added more to this sketch at 5 in the morning because I was in bed and couldn’t fall asleep, so I might as well sketch instead of lying there not doing anything. Haha I think this is working much better than what I posted on June 2nd. I’ve been having so much trouble sleeping at a normal sleep cycle lately. The problem is I’ll get too excited about what I want to do the next day, and I’m pretty sure that causes me to be unable to fall asleep. It’s pretty funny but I don’t like being tired. Did a bird sketch tonight before going to bed. One of the things I’d like to do this summer is create some puppets and try to do some stop-motion with them. I don’t want to start the puppets until I go back home later this month, but I thought I’d do a sketch of what I’d like to make. 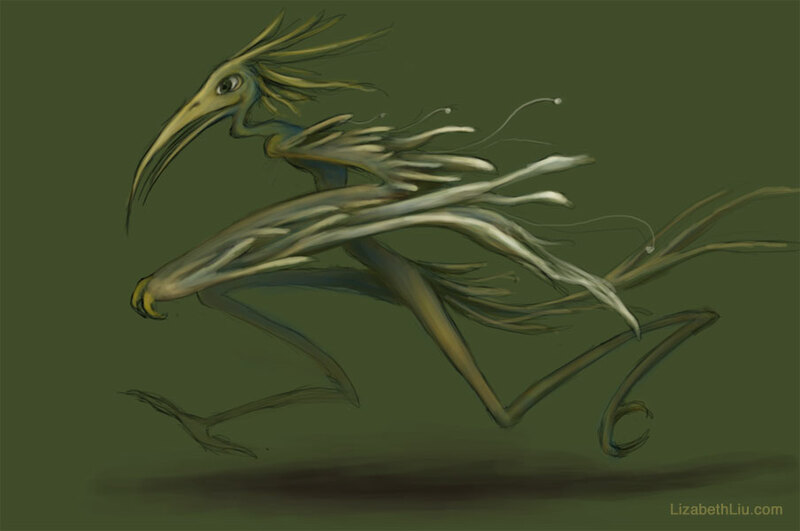 I want to start with wire, and try to create really spindly, spider-like bird creatures with long limbs, and build on that with cloth and maybe feathers. The trick will be getting them to stand on their own. I’m probably going about this the wrong way, but it just sounds like so much fun. 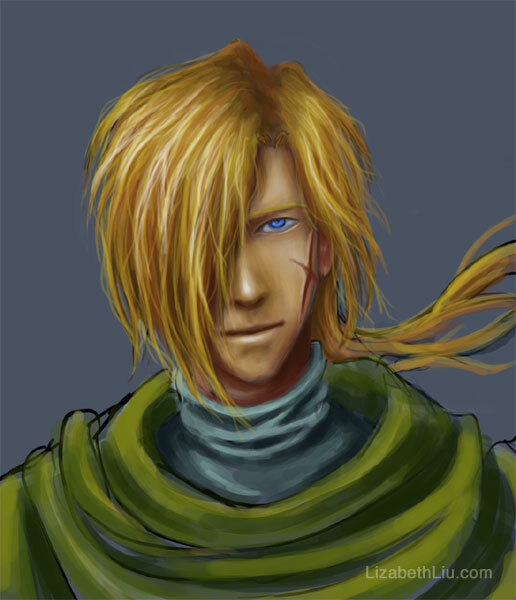 Another character sketch. If you couldn’t tell, this character has an elongated neck. 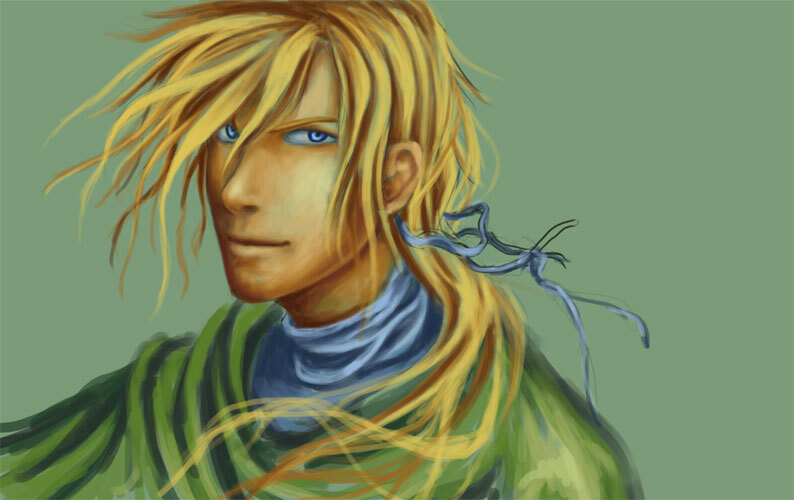 Worked a bit more on that Gremio picture, mainly the chin, ear, eyes and shoulders. A quick character sketch. 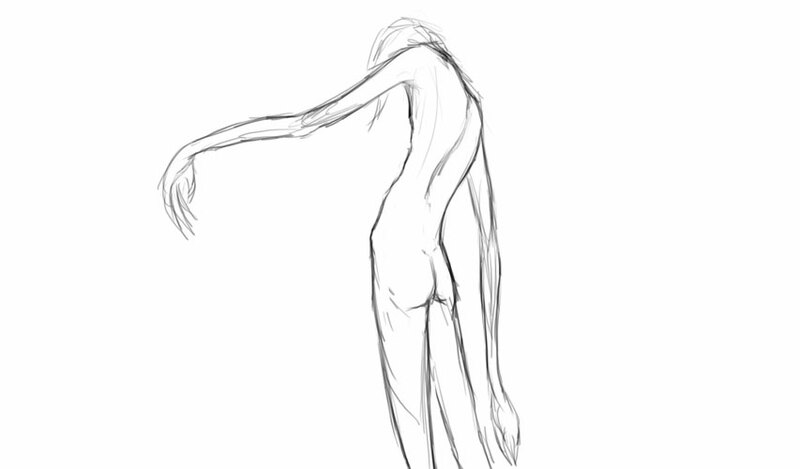 I like elongated torsos (and limbs). 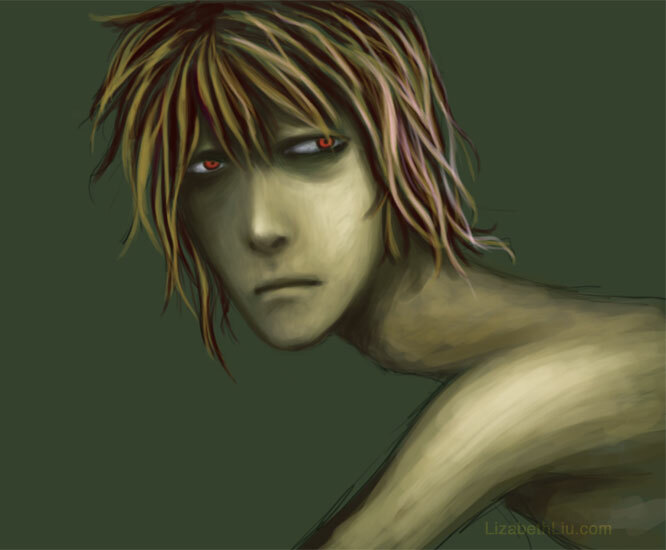 It’s full body, but this cropping looks more dramatic, not sure if I’ll keep it or not. Another fast sketch, I like the shape of the torso. I’ll post pictures from the aviary later. :) Also, drawing Gremio so much caused me to do something I haven’t really done since I started college – go out and buy a video game. In this case, Suikoden IV. Despite reviews, it is surprisingly fun. It’s hard to mess up being a pirate and sailing the high seas. I also really love the character designer, Junko Kawano – she also did the character art for the first game in the series, which I think added a lot of the charm that made that game work so well.